Just thinking out loud as far as a cover design for a new weather book aimed at our friends south of the border. The completion has been painfully slow. But with the addition of an additional graphic artist there is light at the end of the tunnel. Still hoping for an early summer closure. 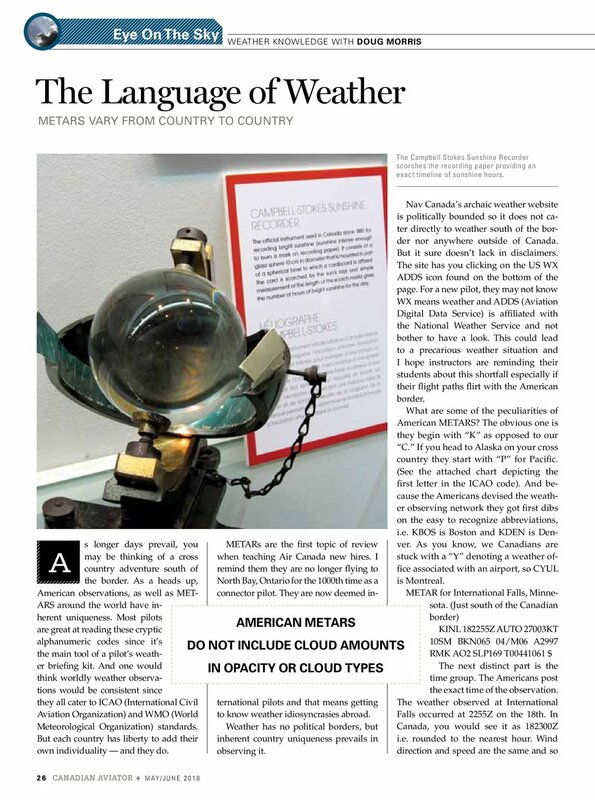 In the latest edition of Canadian Aviator, I discuss how METARS around the world are not created equal. A METAR is the largest staple for any pilot's weather briefing, but many pilots are shocked to learn they actually differ around the world. 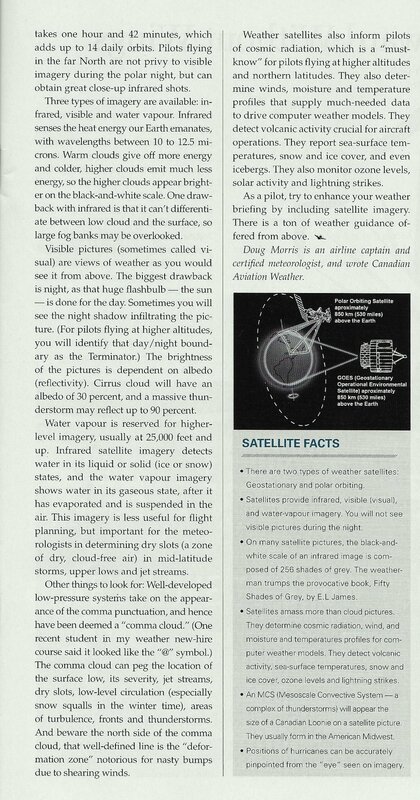 This article will broaden your METAR horizon. Of course, I included an in-depth chapter in my book as well. 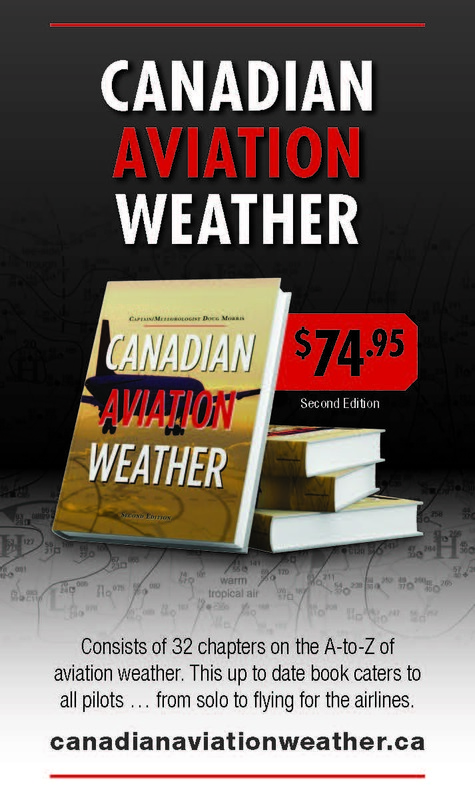 This edition talked about weather across Canada. Some of the pics got sized disporportionatley so here is the graph I wanted to convey. Hopefully you can read this. Back from vacation and I am anxious to expedite Canadian Aviation Weather to a higher flight level. If anyone out there wants to help spread the good meteorological word, I am listening. If a pilot starts making reference to how clouds look, then an eyebrow should be raised. If you hear, "hey, that cloud looks like a bunny rabbit" then suspect an hypoxic state from oxygen deprivation and tell he or she to "go on oxygen!" But how do you respond when a pilot says, "hey, that cloud over there looks like a big (ahem)!" F/O Brent was excited to fly with me (no, not that kind of excited). 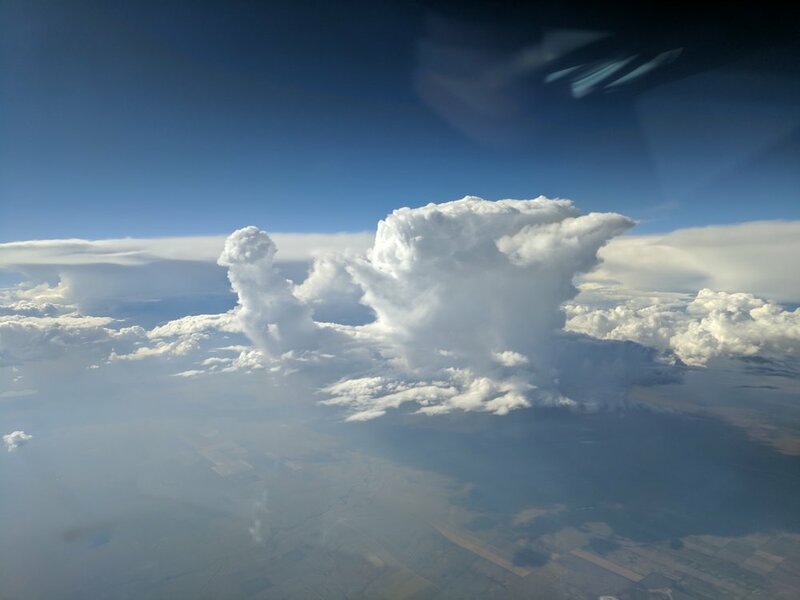 He knew I was a meteorologist and wanted to share a couple of pics he took over Colorado. Most have heard of cloud seeding using silver iodide to suppress the development of a thunderstorm. Maybe viagra was used instead for this cloud? Even though I can't claim ownership to the pics, I will stake it's nomenclature, Ce (Cumulus erectus). This "unique cloud" is actaully caused from the extreme late stages of a dissipating cumulonimbus. (Seriously). 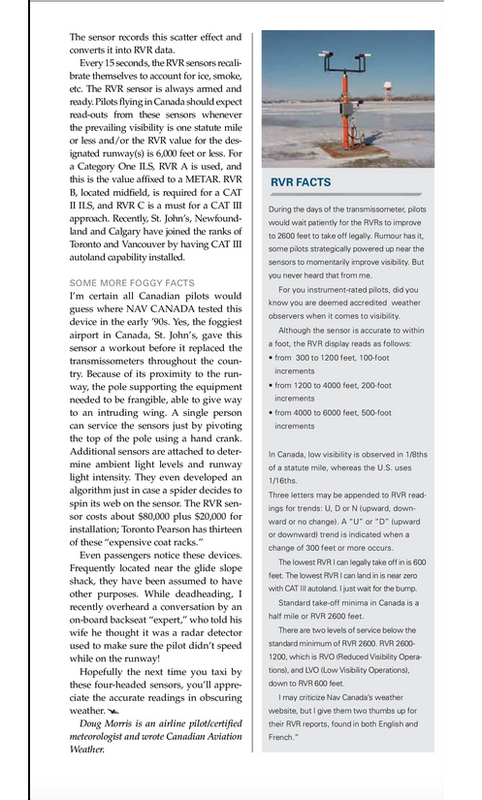 A fellow coworker wrote this great article in Canadian Aviator. Richard Pettit has given me the nod to repost this. 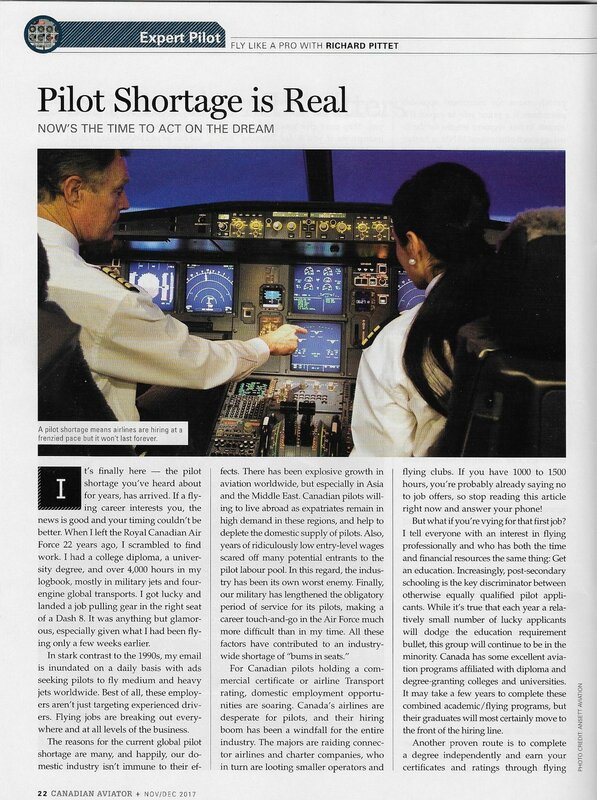 I have been asked for years about pilot hiring. Now, I just have to direct people to this post. 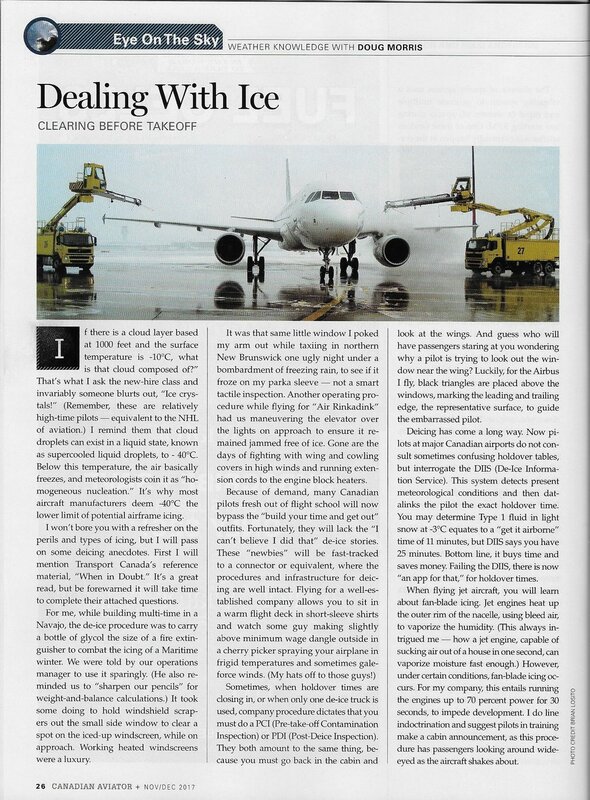 Here is an article on Deicing in the big leagues. 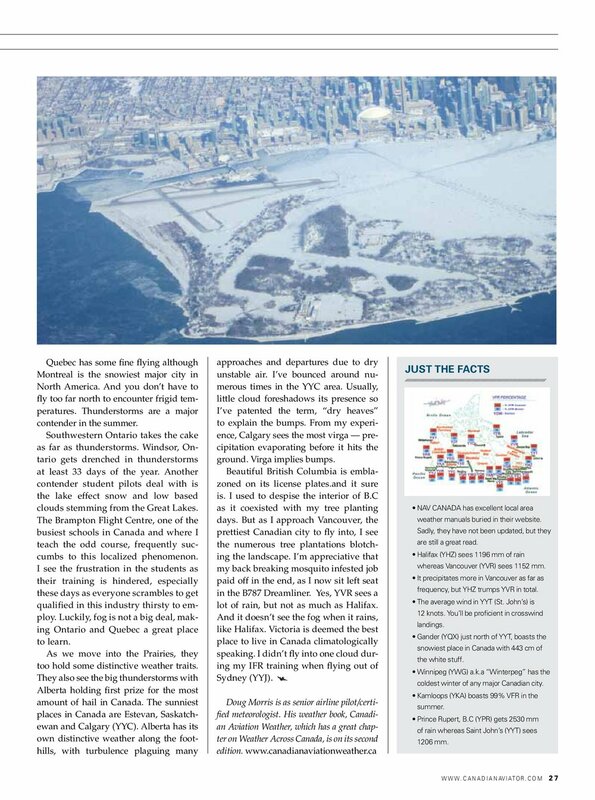 I am trying to get Transport Canada to acknowledge Canadian Aviation Weather as a viable reference to their study guides and exam questions. Presently, they claim it goes against policy to endorse a third party. Ahem! What about references to the FGU and ACWM? And what about safety? Surely some wide eyed 16-year-old pining for the skies or that middle aged "nine to fiver" wanting to learn flying would benefit from a pilot/meteorologist's take on aviation weather? Just saying. I included references from Canadian Aviation Weather Edition #2.
amount of moisture present in the air. weight of water present in the air. amount of moisture present in the air compared to the amount the air could hold at that temperature and pressure. temperature to which the air must be lowered to bring about saturation. Chapter 5 Page 33. Remember the answer must include temperature and pressure reference. is cooled by the cold air underneath. is cooled by the surrounding cold air aloft. becomes unstable as a result of cooling from below. cools as a result of expansion as it rises. I did not specify this fact in chapter 9 in regard to warm fronts. I did allude to it on page 2 when a parcel of air rises, it will expand and cool called adiabatic expansion. moist air moves from a warm surface to a colder surface. the cold ground cools the air in contact with it at night. moist air is influenced by orographic effect. moist cool air moves from a cold surface to a warm surface. passage of cold air over a warm surface. air becoming moist as it moves over the sea. clouds becoming cold and heavy at night so that they settle to the ground. ground becoming cold at night and cooling the air in contact with it. clockwise around high and low pressure areas. counter-clockwise around high and low pressure areas. clockwise around a high pressure area and counter-clockwise around a low pressure area. counter-clockwise around a high pressure area and clockwise around a low pressure area. Chapter 10 (Boundary Layer Winds and LLWS) Page 70 We pilots learn that winds generally veer and increase with height but TC adds a twist by asking what happens when you descend. veer and increase in speed. veer and decrease in speed. back and increase in speed. back and decrease in speed. Chapter 10 (Boundary Layer Winds and LLWS) page 76. Chapter 2 (Stability and Lapse Rates) Standard lapse rate is 2°C/1000’ starting with surface standard at 15°C. See graph page 9.
moist air, high temperature, and an inversion. stratus cloud, high humidity and a lifting force. unstable air, high humidity and a lifting force. a mixing of two different air masses. Chapter 15 (Thunderstorms) Page 117 It is highlighted but I said lifting agent instead of lifting force. Chapter 2: Stability and Lapse Rates page 10.
strong winds, cumulus cloud, good visibility. fog, poor visibility and layer cloud. narrow zone of fog between a cyclone and an anticyclone. narrow transition zone between two air masses. mass of layer cloud which is very thick and which covers a wide area. warm air is compressed as cold air rides over it. temperature rises owing to increased pressure. fog will always form from the interaction of warm and cold air. warm air is lifted as colder air pushes under it. the passage of a cold front. the passage of a warm front. clearing skies and a decrease in temperature. I didn’t address altimetry to great depth. (This is worthy of chapter) Most pilots know the adage when flying “from a high to a low, look out below.” As your flight enters lower pressure, the altimeter will depict a higher altitude. In other words, instead of a true altitude of 5000’ your altitude may be 5500’ but you as a pilot will unknowingly descend to compensate for this. The opposite happens when you fly from a low to a high. Your true altitude will descend so you will climb to compensate. Which is the better of the two. Chapter 20 Upper Winds and Temperatures Page 158. 69. The forecast surface wind will be included in a GFA if it has a sustained speed of at least . . . . . kt. The center of the low pressure system is . . . . . between 1800Z and 0000Z. 71. Refer to the Appendix: WEATHER SYNOPSIS # 100 (GFA). This forecast covers a period of . . . . . hours and includes a . . . . . hour IFR outlook. become overcast at 200 ft.
73. Refer to the Appendix: WEATHER SYNOPSIS # 100 (TAF). 15 SM in wet snow. 15 NM in wet snow. 74. Refer to the Appendix: WEATHER SYNOPSIS # 100 (TAF). The Gillam (CYGX) aerodrome forecast covers a period of . . . . . hours. 75. Refer to the Appendix: WEATHER SYNOPSIS # 100 (TAF). visibility is greater than forecast. ceiling is lower than forecast. winds are weaker than forecast. expected at a station at a given time. expected at a station over a 12 hour period. observed at a station at the time of the report. observed at a station during the previous day. I thought of writing a deice article for my pending contribution to Canadian Aviator and started doing TC's When in Doubt surface contamination exam. (If you are into forms, it's the TP 10643). (1) is not considered as adhering to the aircraft and a take-off may be made. (2) must be considered as adhering to the aircraft and a take-off should not be attempted. (3) is only considered as adhering to the aircraft when Vr speeds are below 100 kt. (4) is not considered as adhering if the aircraft has been de-iced and then anti-iced. Reference: WID (When in Doubt) Page 52 #77 Frost, ice or snow on top of deicing or anti-icing fluids must be considered as adhering to the aircraft and take-off must not be attempted. (1) it has been de-iced. (2) it has been inspected immediately prior to take-off to determine whether any frost, ice or snow is adhering to any of its critical surfaces. (3) its skin temperature is warm enough to ensure that adhering frost, ice or snow will slide off on take-off. (4) its power and runway length are sufficient to allow acceleration to Vr plus 10% before rotation. Reference: CARS 602.11 page 452The aircraft has been inspected immediately prior to take-off to determine whether any frost, ice or snow is adhering to any of its critical surfaces. (2) may be commenced provided the anti-ice fluid used was of the type that prevents ice or snow from sticking to the critical surfaces. (3) may be commenced provided the amount of frost, ice, or snow does not exceed that specified in the company operations manual. (4) must not be attempted until confirmation is obtained that the aircraft is clean. (1) take off but delay rotation until Vr plus 10%. (2) take off as wet snow will slide off as the aircraft becomes airborne. (3) taxi back to the apron, shut down the engine you are able to restart and have the critical surfaces carefully de-iced. (4) cancel the flight until proper equipment is available or necessary repairs made. (1) confirmation from the crew chief that the fluid used has the required holdover time. (2) ensuring the aircraft is not subjected to excessive ground delays. (3) close inspection by the PIC or designated flight crew member. (4) ensuring take-off is within the applicable holdover time table. Reference: WID P.52 #74Pre-Take-Off Contamination Inspection: As required by regulations, immediately prior to take-off, a pre-take-off inspection shall be made to determine whether frost, ice or snow is adhering to any of the aircraft critical surfaces, except where the operator has established a program in accordance with GOFR 622.11 and complies with that program. The pilot may need the assistance of qualified personnel to perform this inspection. 1.06 Who may inspect an aircraft immediately prior to take-off to determine whether any frost, ice or snow is adhering to any of its critical surfaces? A. a flight crew member of the aircraft designated by the PIC to carry out the inspection. D. a person designated by the operator who has received the required surface contamination training. E. any Aircraft Maintenance Engineer. (c) a person, other than a person referred to in paragraph (a) or (b), who (i) is designated by the operator of the aircraft, and (ii) has successfully completed training relating to ground and airborne icing operations under Subpart 4 or relating to aircraft surface contamination under Part VII. (1) shall immediately report that observation to the PIC. (2) need not report that observation if the aircraft has recently been de-iced. (3) shall immediately report that observation to the designated crew member. (4) unless designated, need not report that observation. Reference: CARS 602.11.6 Where, before commencing take-off, a crew member of an aircraft observes that there is frost, ice or snow adhering to the wings of the aircraft, the crew member shall immediately report that observation to the pilot-in-command, and the pilot-in-command or a flight crew member designated by the pilot-in-command shall inspect the wings of the aircraft before take-off. 1.08 Before commencing take-off the PIC is advised that there is frost, ice or snow adhering to the wings of the aircraft. (1) may take off without a further wing inspection if the aircraft has been recently de-iced.2. (2) shall request a go/no go decision from company operations. (3) shall request the deicing crew to inspect the wings before take-off. (4) or another flight crew member designated by the PIC shall inspect the wings before take off. Reference: CARS 602.11.6 (2) No person shall conduct or attempt to conduct a take-off in an aircraft that has frost, ice or snow adhering to any of its critical surfaces. (1) unless it has been de-iced if frost, ice, or snow conditions exist. (2) unless assured that adhering frost, ice or snow will slide off on take-off. (3) if frost, ice, or snow is adhering to any of its critical surfaces. (4) if frost, ice, or snow adhering to the critical surfaces cannot be removed on take-off by the aircraft deicing systems. (2) on initial hiring and annually. (4) on initial hiring only. Reference: WID p.15 #13 The CAR’s require that all personnel involved in aircraft operations shall have initial and annual recurrent critical surface contamination training to continue performing their duties. This includes all ground personnel directly participating in aircraft operations such as, deicing crews and baggage handlers. Any person observing frozen contamination on the aircraft critical surfaces shall report this immediately to the PIC. Even though I am sitting home idle with a broken leg doesn't mean I put the second edition on the back burner. Steve Ricketts wrote some kind words regarding my book. Thank you Steve! A friend of mine was recently flying over Amsterdam and managed to catch this relatively rare noctilucent cloud. In case you are wondering...this is a high-altitude cloud that is luminous at night, especially in summer in high latitudes. This just in...Transport Canada amends TC AIM and heeds my take on things. 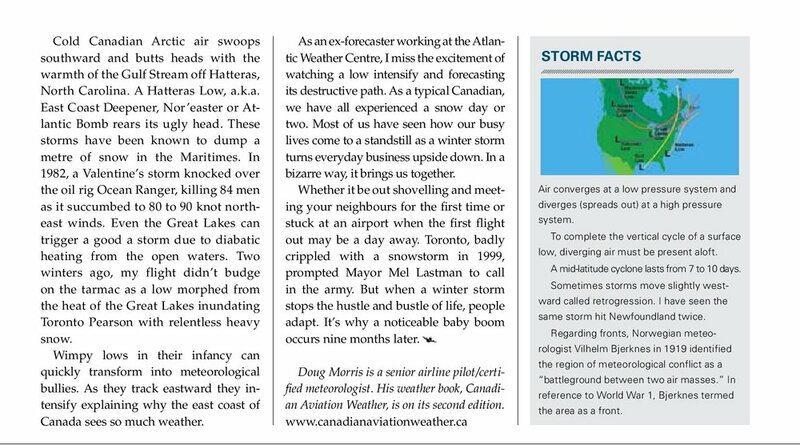 My March 11 post depicted my second article in Canadian Aviator regarding the gap (where one could drive a cement truck through) between the weatherman and the pilot. Especially when it comes to their archaic website! Well guess what? Transport Canada addressed it, albeit indirectly by releasing a memo. Progress! 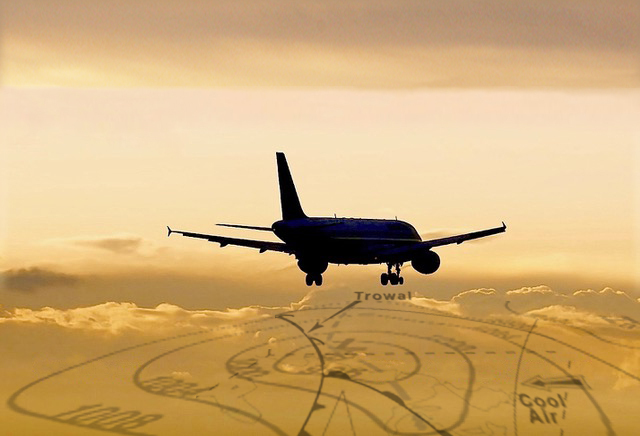 (b) Aviation weather web site (AWWS)—NAV CANADA’s aviation weather web site (AWWS), available at <https://flightplanning.navcanada.ca/>, and collaborative flight planning system, available at <https://plan.navcanada.ca>, offer aviation weather products, NOTAM and the ability to file flight plans. For more information, visit <www.navcanada.ca>. Pilots operating near the border should note that U.S. METAR, SPECI and TAF must be obtained through the Aviation Digital Data Service (ADDS), available at <www.aviationweather.gov/adds/>. I taught an airframe icing class a few weeks ago to about 30 students thirsty for aviation knowledge. During the class, I was given a copy of 80 questions from Transport Canada's website, the TP 10643, which I was told to hand out. These are great questions, but I am having a difficult time finding reference material or even better the answers. I did scan the "When in Doubt" write up but that doesn't have many of the answers. For example, the very first question: Frost, ice or snow on top of deicing or anti icing fluids....MUST be considered as adhering to the aircraft and a take off should not be attempted. I knew the answer but where the heck is it written? Again, great questions, but where is all the material? Even a ground based propeller has to be deiced. What a task!